Recently, I became familiar with the term, Hat Man. It was from a reader, who was sharing a spiritual experience and wanted some advice. After the second or third e-mail, she mentioned the name Hat Man. My first reaction was, "Who is the Hat Man?" It was a new concept, and one that I needed and wanted to be explored. A day or so later, I was watching a movie called The Adjustment Bureau with Matt Damon. The concept of the Hat Man resurfaced once again. In the movie, the Hat Men were guardians who were sent to earth to watch over the human race. Was spirit trying to tell me something? Was this what the woman was referring to? I needed clarification. I wrote to her for further explanation. She was more than happy to abide. The following is MM own words about her Spiritual Hat Man experiences. "I will be more than happy to tell you about my experiences with the Hat man. After reading about people’s bad experiences with Hat men, I feel someone should tell people out there that Hat men are not all bad. Moreover, if there are bad or negative Hat men out there, where are they getting their negative energy from? The first time I ever encountered a Hat man Entity was in my teens. I was sleeping in my sister’s bed. She was out, and I thought she was not going to come home that night. Some early hour of the morning, I was dreaming that the bedroom door had opened. In the doorway was a black figure wearing a wide-brimmed hat and a long trench coat. There was a bright white light shining behind him. He started to walk toward me. It all seemed so real, as if someone was actually in the room. The closer he got, the more scared I became. When he approached me, he put out his arm as if to pull the blankets down. I felt him touch me. I screamed and woke up at the same time. There in front of me was my sister, who had returned home and was trying to wake me up. When I went back to my bed, I said to the Hat man, in a stern and angry tone, ‘if you can hear me, the man with the hat, please don't scare me like that again. It's not very nice.’ For a long time, I did not have any contact with him. Then, I met my husband. Some years later, we had a party at his house. We had a big feed and a bit to drink. When our friends left, we went to bed. During the night, I felt someone hit my shoulder. When I opened my eyes, I saw the Hat man. He dashed quickly to the other side of the bed where my husband was sleeping. For some unexplainable reason, I quickly got on my knees on the bed, and grabbed my husband’s arm, trying to pull him up. Suddenly, he sat up. It was, as though, someone had pushed him from his back. He started throwing up large chunks of food onto the bed. I immediately turned the light on, After seeing what had happened, I realized that he could have choked in his sleep if the Hat man did not tap me on my shoulder waking me up and guiding me on what to do. Moreover, I believed that the Hat man had sat him up. There was no way, I would have been able to sit him up, especially from the side and by pulling one of his arms. I thanked him.The next day, I told my husband what had happened. He didn't remember a thing. Years later, the Hat man resurfaced. It was approximately 9.20 pm, and I was waiting for my husband to come home. I was getting ready to turn the kettle on, when suddenly, I saw, in my third eye/mind the Hat man saying to me "I'll save him." Then, he opened one side of his long coat and swished away. In addition, I could see a vehicle with a bright white light inside, at a distance, about to roll on the road. When the vehicle stopped, it was upside down. It felt as if l was transported to the street where the accident occurred and then back home. When I came to, the thought that it could be my husband came to me. All I could do was wait for him to either come home or call. An hour later, he called me from the hospital. He said he was a bit drunk and rolled the yute (vehicle). When I got to the hospital, he appeared to be fine. He only had a scratch on his back from crawling out of the smashed window. The next morning, he told me that all he remembered was a bright white light. Although he knew that the yute was rolling, he didn't feel like he was rolling around, He believed that gravity must have stopped him from being thrown around! Can you believe it! The next morning, we went to see the yute. It was completely damaged. A witness told the police that the yute rolled about 5-6 times. Since the yute- a 1950's short 2x door tray-back, was not equipped with seatbelts, my husband was not wearing one. Once again, I thanked the Hat man." The following is an email I recently received from MM. "I not sure if you remember me, but I wrote to you about the Hatman, and sent you the Spirit Stone picture. I was looking through my photos the other day and came across this picture of me. You can clearly see a man with a hat in front of me. It's a bit blurry because something whooshed himself into the picture. I felt a slight gust of wind, as if someone blew towards me at the time the photo was being taken. 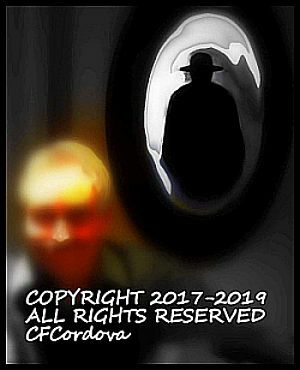 I think it's a picture of a Hatman, and he looks just like the one I quickly saw when my partner Shane was in an accident." 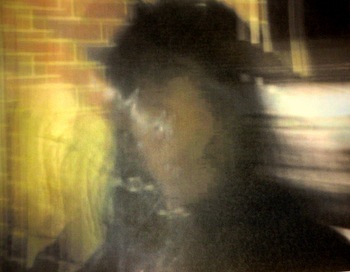 Below is the photo of the Hat Man Entity mentioned above. Thank you MM for sharing experience and photo. Your story has made me a believer of the Hat Man Entity. Hat Man Entity, Hat Man Entity, Hat Man Entity, we welcome you for the good of all humanity. This is not the end of Hat Man Entity; It is just the beginning.